Aaron Lucero joined CCGD as Concert I Chorus Assistant Conductor in 2013 and became Youth Chorus Assistant Conductor in 2014. He serves as Choral Conductor at Newman Smith High School in Carrollton/Farmers Branch. Previously, he served as Associate Choral Director at Lake Highlands High School, where he taught choir and AP music theory, and the Associate Choir Director at Robinson Middle School in Plano ISD. Choirs under the direction of Mr. Lucero have received Sweepstakes at UIL contest and have also been successful at Region and Solo and Ensemble contests. In 2012, he assisted and conducted the Robinson Middle School Varsity A Cappella Treble Choir at the Texas Music Educators Association’s annual convention in San Antonio. Mr. Lucero is a sought after tenor soloist in the DFW Met﻿roplex and currently sings in the Highland Park Presbyterian Chorale. He qualified as a finalist in the 2009 National Association of Teachers of Singing competition and was a semi-finalist in the National American Choral Directors Association Student Conducting Competition in 2011. He currently serves as the Music Director for Community Christian Church in Richardson, TX. 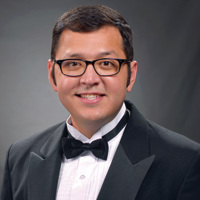 Mr. Lucero is a 2012 graduate of Texas Tech University where he received his Bachelor degrees in Music Education and Vocal Performance with a minor in Italian. He holds active memberships in the Texas Music Educators Association, Texas Choral Directors Association, and the American Choral Directors Association.